It’s a weird thing, trying to time a garden to look spiffing just for one day. I’m starting to feel like the Queen of Hearts in Alice in Wonderland, muttering “off with their heads” every time I find a flower bud that has deigned to show its face early. I’ve taken to daily patrols of the flower border in front of the stables, armed with a pair of secateurs, to snip off any open blooms. It feels like sabotage. But deadheading is hardly a chore when the spin off is an endless supply of free fresh flowers to fill up the vases. All my dahlias, especially the delicious ‘Raspberry Ripple’ (pictured above), with its burgundy-splashed petals, are going great guns. I’m a little nervous that they’ve peaked too soon. Here’s hoping the half bag of Nitrophoska Blue I dumped at their feet today will keep them in good spirits for another six weeks. 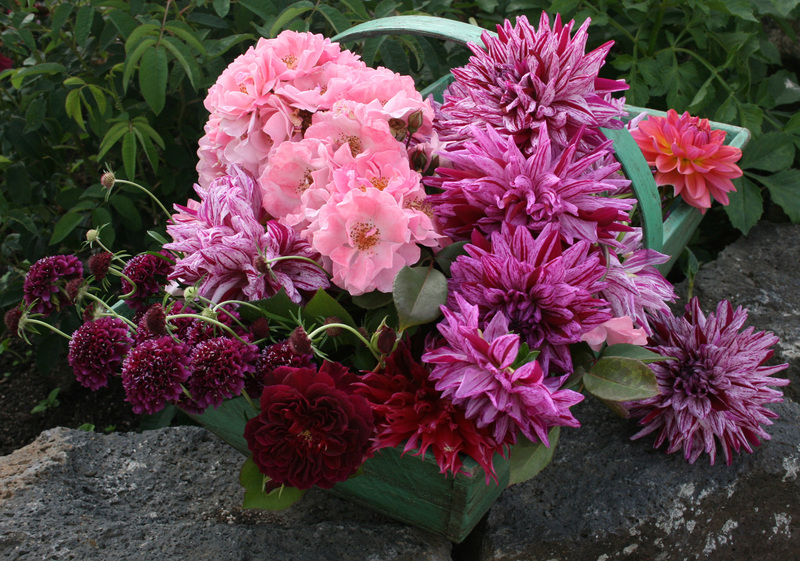 The best, best, best place to buy dahlias to plant is http://www.dahliahaven.co.nz. They have wonderful open days at this time of the year, with thousands of display beds in bloom. I can’t recommend them highly enough. All of the tubers I’ve got from them have thrived. OMG!! Never thought of myself as a dahlia fan, in fact always thought of them in terms of a grandmother’s garden, but have just visited the above website and think I might have fallen in love! Another of my current favourites is ‘Bumble Rumble’, a super cute collerette. There’s a pic on this page. It’s just delightful. I really enjoy your blog etc and am really hoping that your wedding day is perfect in every way….. but please do not get too ferocious with the early flowering,,, afterall…they are not the only entities that have jumped the gun,,,so to speak!!!! I love your forthreightness. 50 years ago, while studying at the School of Home Science, Otago University, I became pregnant to my medico fiance. It was fashionable to declare a ‘nervous breakdown’ and leave, but I defied tradition and stayed on (which upset some matriachal lecturers) and still feel jubilent to-day (as a grandmother of 7) that I made that decision).